Another day, another report. This time it’s from Edison Research/Arbitron Internet and Multimedia Series detailing on Twitter awareness among Americans. 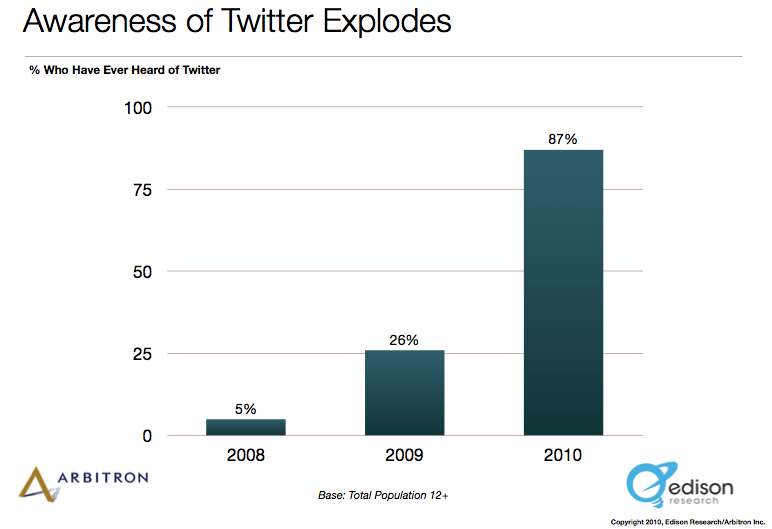 Key findings of the Edison report revealed that awareness of Americans on Twitter increased significantly from 5% in 2008 to 87% in 2010. 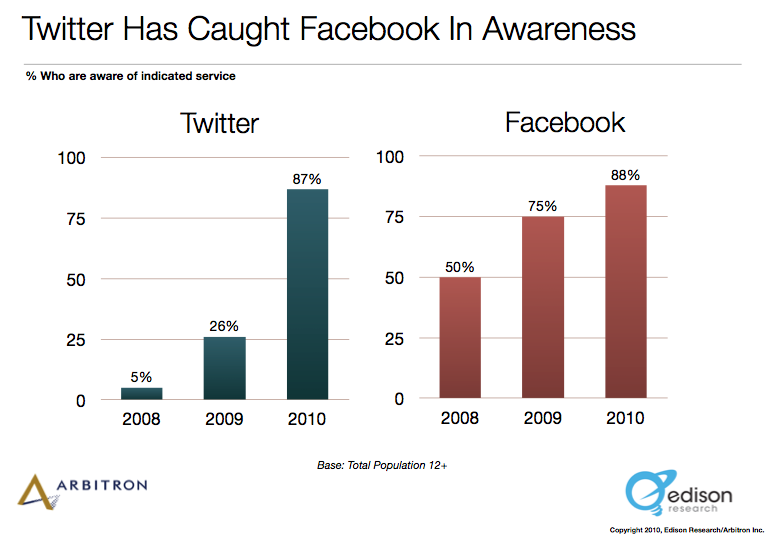 The study, which was a result of three years of tracking data from a nationally representative telephone survey of 1,753 Americans conducted in February 2010, also showed that Twitter and Facebook both have almost the same awareness (Facebook has 88%) but in terms of usage, Twitter is still behind Facebook. There are now 7% Americans of the 17 million Twitter users who actively use Twitter, while 41% actively maintain a Facebook account. In addition, the report also found out that two-thirds of active Twitter users access social networking sites using their mobile phones. 51% of active Twitter users follow companies, brands or products on social networks. Awareness of Twitter has exploded over the past twelve months. Despite near-ubiquitous awareness, Twitter is currently used by seven percent of the population, or approximately 17 million Americans. As such, Twitter has yet to articulate its value and usage benefits to the vast majority of Americans. Twitter does appear to be disproportionately popular with African-Americans. One strategy to encourage Twitter adoption may be to emphasize the parallels between status updates via Twitter and SMS messaging. With nearly half of all Americans maintaining profiles on social networks, Twitter must tap into the motivations of those Americans to maintain relevance in the face of Facebook’s continued encroachment into the real-time status updating and search spaces. The majority of Twitter users are “lurkers,” passively following and reading the updates of others without contributing updates of their own. 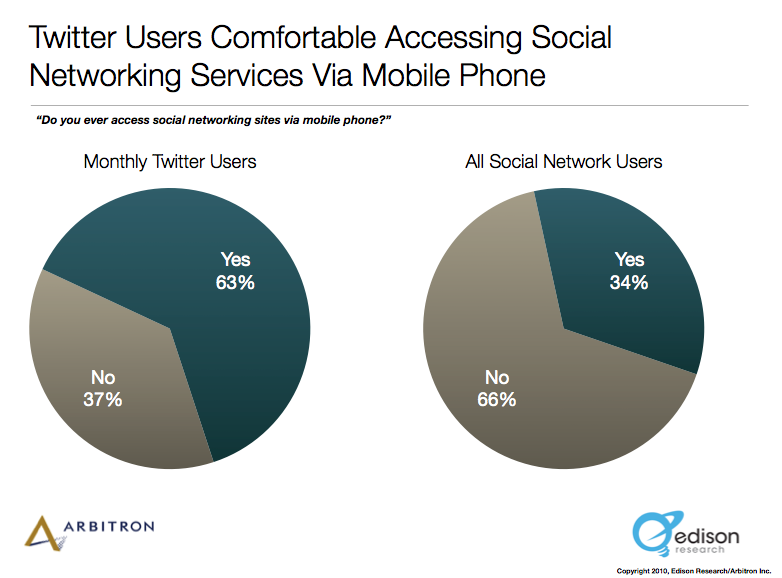 Marketing and Business use cases for Twitter far exceed similar usage for social networking Web sites in general. Twitter is a natural “companion medium” to other media channels – in particular, as an accompaniment to live TV. A significantly higher proportion of Twitter users update their social networking profiles – and access Twitter – using mobile phones than the average user of other social networking sites and services.